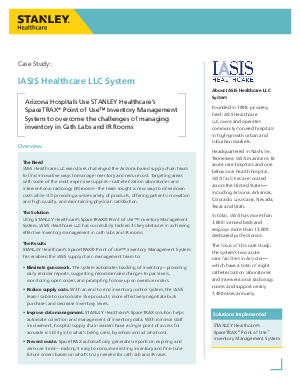 IASIS Healthcare LLC executives challenged the Arizona-based supply chain team to find innovative ways to manage inventory and reduce cost. Targeting areas with some of the most expensive supplies—catheterization laboratories and interventional radiology (IR)rooms—the team sought a new way to drive down costs while still providing a wide variety of products, offering patients innovation and high quality, and maintaining physician satisfaction. Read this case study to learn how Arizona Hospitals use STANLEY Healthcare's SpaceTRAX® Point of Use™ Inventory Management System to overcome the challenges of managing inventory in Cath Labs and IR Rooms.